The Fourth Canvas is an intellectual thriller, an ambitious novel of ideas full of juicy characters. Rana Bose tackles the enigma at the heart of all great thinkers and doers. In the early nineteen seventies a reclusive, but well-known artist and philosopher disappears in Paris after completing a fantastic series of canvases that trace the rise and fall of empires. Eventually his bloated body is dragged from the Seine. The knowledge and insight die with him. Years later, Claude Chiragi, a graduate student in Montreal receives a mysterious painting and senses the relevance of the theory embedded in the artwork. His curiosity is instantaneously aroused, and he soon launches a global search for clues that will help him understand the message, while unraveling the mystery of the artist's fate. Embedded in the paintings are tell-tale historical clues, mysteriously coded, that predict imperial entropy in the future—from economic collapse and cultural decadence to an imminent coup d'etat against civil society. Fourth canvas is a gripping tale about the rise and fall of empires. Kidnappings, killings, under cover conspiracy and a trek back into the historical ancestral roots of one of the main characters, lend to a novel that spans many continents, several stimulating personalities and a diverse range of nationalities. Claude loses his family and friends in the course of his adventure, but in the end he understands and embraces the message in the Fourth Canvas. Woven within the imagination of this hero's journey is a fabric of ideas, a latticework to stimulate the reader's political perspective in post-9/11 society. Fourth Canvas is a novel about the world today, with little room for cynicism and disillusionment. There is no easy exit to hedonism or Hollywood, no exile from truth. This book is a magical story of idealism fulfilled. Somewhere along the way, the main protagonist says it all. "Its not about George Clooney making a movie and demonstrating how rotten and malfeasant the powers that run the world are actually, … its less attractive, in fact its boring…you cannot make a film on all this, you cannot write a novel, you cannot do a play, you cannot make it entertain…its very simply the stuff that makes sensitive and intelligent people grapple with the unsexed truth that surrounds them and then do something about it..."
Playwright and engineer, Rana Bose lives in Montreal. His plays have been staged in Canada, the United States, and India. Multilingual Writer, Playwright, Poet, and Dramaturge, with over twenty years of involvement in writing, theatre and production work on stage. Rana Bose was born in Kolkata, India and has lived in North America for over thirty five years His first novel, with the assistance of a Canada Council Writers Grant, was published by Vehicule Press, Montreal, (Recovering Rude). Ten of his plays, all of which have been published, have been performed in Montreal, Toronto, Vancouver, Guelph and in India. He has written over 100 articles, reviews, short stories and critical essays, that have been published in various publications and his works have been broadcast and reviewed on CBC, as well as in the Montreal Gazette, the Montreal Mirror, The Montreal Hour, the Globe and Mail, the Ottawa Citizen as well as in several digital Magazines. The Fourth Canvas is his second novel, to be published by TSAR, Toronto in the fall of 2008. Rana frequently performs at the Yellow Door and the Fairmont Arts Cafe in Montreal. After his life’s work is stolen, writer and philosopher Guillermo Sanchez turns to painting as a form of expression - until he is found dead, drowned in the Seine. About 25 years later, Claude Chiragi decides to learn the secrets behind a series of Sanchez’s paintings and the mystery behind the artist’s death. What will he learn about the artist, the world, himself? The Fourth Canvas by Rana Boxe is at once historical, intelligent, and fascinating. Pick up this book and you’ll be immediately swept into a tide of captivating language and a complex plot. Pulling you from Montreal to India to Cuba and back, you’ll find this book to be theatrical with the intensity of a brainy Bourne Identity. Full of intrigue, Bose’s novel makes a deep political statement, feeding the mind while offering up an entertaining mystery. With complex characters, a wide-spanning time period, and historical fact mixed with brilliant fiction, The Fourth Canvas will leave you asking, “When is the next Bose book ready?” As a new fan of this author’s work, I’ll definitely let you know. 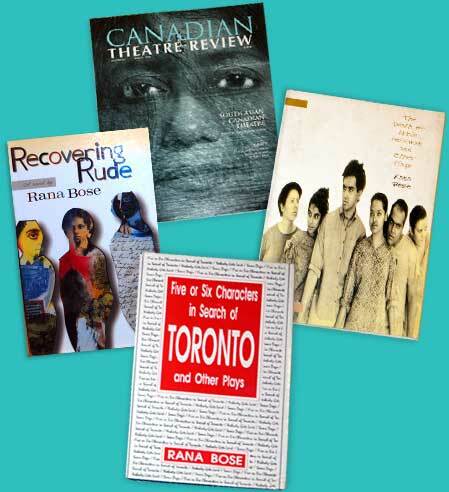 Rana Bose has published 10 plays and is a well-known playwrite in Canada. His first novel, Recovering Rude, has received rave reviews as well. Using six degrees of separation and a mysterious artist's fourth canvas, author Rana Bose builds one great story. The author sends us around the world, first on a mission to find family roots and then to unlock the secrets of philosopher painter Guillermo Sanchez. There are codes in his canvases, and people who boldly turn their heads to look out from their painted images. Meanwhile, the humans searching for any small link to the artist, any small hint of who he was, are themselves intriguing - they fall in love, they stumble in their lust and they lose each other in curious ways. Each of the key males in this, Bose's second novel, has a connection to Canadian Diana McLaren. She is cousin to Indian Lyngdoh Meklar (derived from McLaren), lover of Subhash Ganguli, stepmother (or more?) to Claude Chiragi, and fan of Sanchez. Diana is tall and strong, smart and confident. She is the story's catalyst, first in her search for her roots, and then in her relationships. Her strength and individuality are not empathetic qualities. Instead, she is a rudder steering the author's divergent plot. Her character remains static, even steps aside, as the characters of the men around her develop. Yet Bose propels Diana with good effect, and through her we somehow keep track of all the countries and people we encounter. His layered story begins to hint at something much bigger. With all the far-flung connections and ties, in the atmosphere of an age-old struggle, we are reminded of The Da Vinci Code. The answer - seemingly to everything - is the painter's theory: Two periods of rise followed by two periods of fall. A simple statement and yet the surprising, dangerous complications show its significance as Bose's compelling tale unfolds. A visceral, shiver-inducing ending in which calculated revenge becomes the sweetest possible redemption. A combination of reminiscences, political memoirs, epic family sagas, and a revenge story, all in a 200-plus page book, it does more than surprise . . . Bose has written a novel with depth and honesty. His stories of japes, pals, neighbourhood shops and local beauties are far from innocuous; each line can be read once for sensual pleasure and for a commentary on cultural resistance to entrenched power structures. If the author intended to …. (document) a struggle that had a profound effect on the political landscape of India, he has done so admirably well. [Recovering Rude] is highly recommended to Indian history mavens, social activists and the general reader who is enthralled by the wonder that India still is in spite of herself. ENFIN- C'est enfin arrivé. Un théâtre expérimental qui sonne vrai. Non seulement vrai, en fait, mais encore riche, fringant et prometteur. C'est que la compagnie Montréal Serai n'expérimente pas pour s'afficher hors la norme, pas plus que pour cacher la stérilité de ses propos derrière des techniques de scène révolutionnaires. Rana Bose a des choses à dire et sa compagnie les dit spontanément, dans le langage de son époque, et ce, sans jouer les désabusés. Nous sommes confrontés à de jeunes gens des plus contemporains qui côtoient la désillusion, mais qui sont aussi frôlés par l'effluve du changement. Saisiront-ils ce vent, cette danse, cette chance, cet inconnu ou s'embourberont-ils dans la monotonie et les faux exutoires? Mise à part Diana Lewis qui fait décrocher le spectateur par son excès de zèle, les comédiens sont tous savoureux. S'il y a quelques maladresses, ce sont celles de l'ingénue et elles sont amplement absorbées par le flot de sincérité et d'ardeur qui submerge le spectateur, spectateur que le théâtre contemporain a si bien su affamer de spontanéité et d'idéalisme. Montréal Serai: c'est frais, c'est intrigant, c'est urgent d'enthousiasme; bref, c'est la relève. Rana Bose's first novel begins in a comfortable Calcutta neighbourhood where the sons and daughters of the well-to-do have perfected the art of transforming themselves into street urchins. After school and at night, mostly on the threshhold of adolescence, they eagerly mix with fascinating visitors from the edge of town who carry the seeds of Calcutta's legendary social unrest. Their political activity takes place in the carnival atmosphere of the city's streets and markets, until a bloody political clash turns them into adults before their time. And while they inevitably grow up and grow apart, their lives remain inextricably linked by the carnage and cover-up they were powerless to do anything but witness. Rude, a young rebel with a cause, keeps a diary which is confiscated by a corrupt anti-terrorist poice officer. Twenty years later, Nina, who might have loved Rude, decides at all costs to recover the diary and the history that was stolen from them. Set mainly in Calcutta, Houston, and briefly in Montreal, Rana Bose deftly introduces us to a cast of characters who bristle with life. Humour and despair intertwine like strands of DNA - until the human condition is laid bare and 'recovery' is finally complete. There are no readings scheduled at this time. Please check back here often.